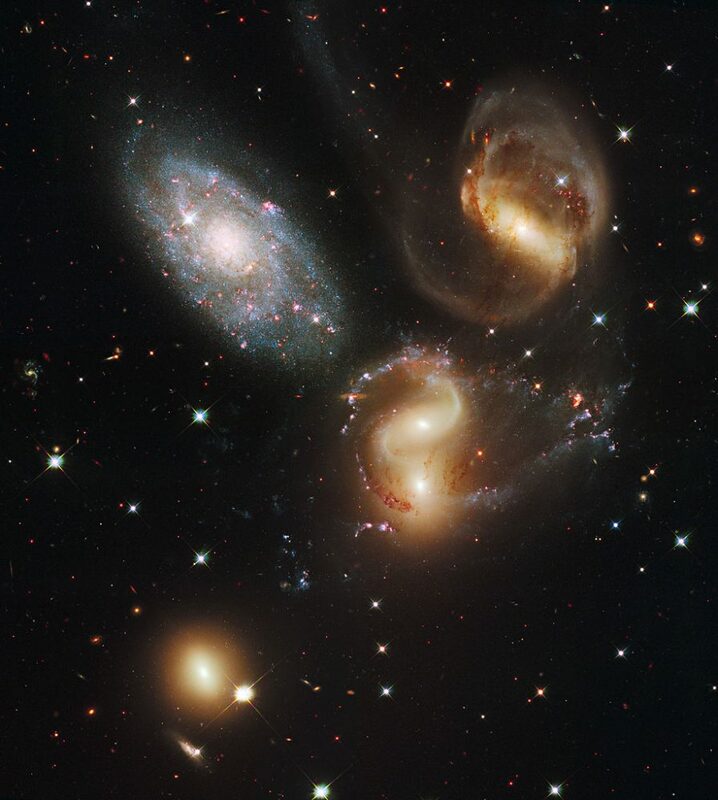 Stephan’s Quintet is a group consisting of four interacting galaxies – NGC 7317, NGC 7318A, NGC 7318B and NGC 7319 – and a visual companion, the spiral galaxy NGC 7320. The galaxies are located in Pegasus constellation. The four interacting galaxies are members of the first compact galaxy group ever discovered, the Hickson Compact Group 92. 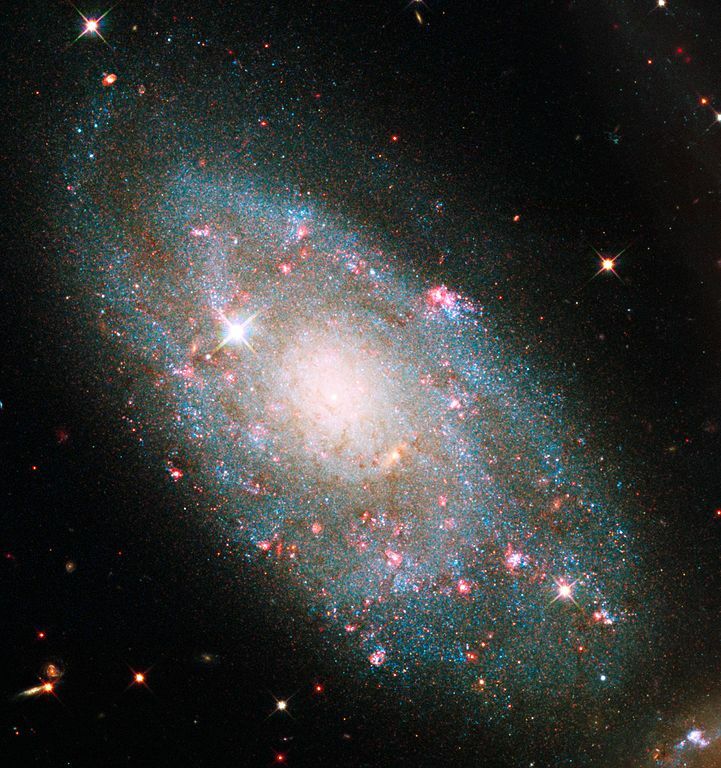 Compact groups are typically groups of about five galaxies in close proximity and isolated from other galaxies. 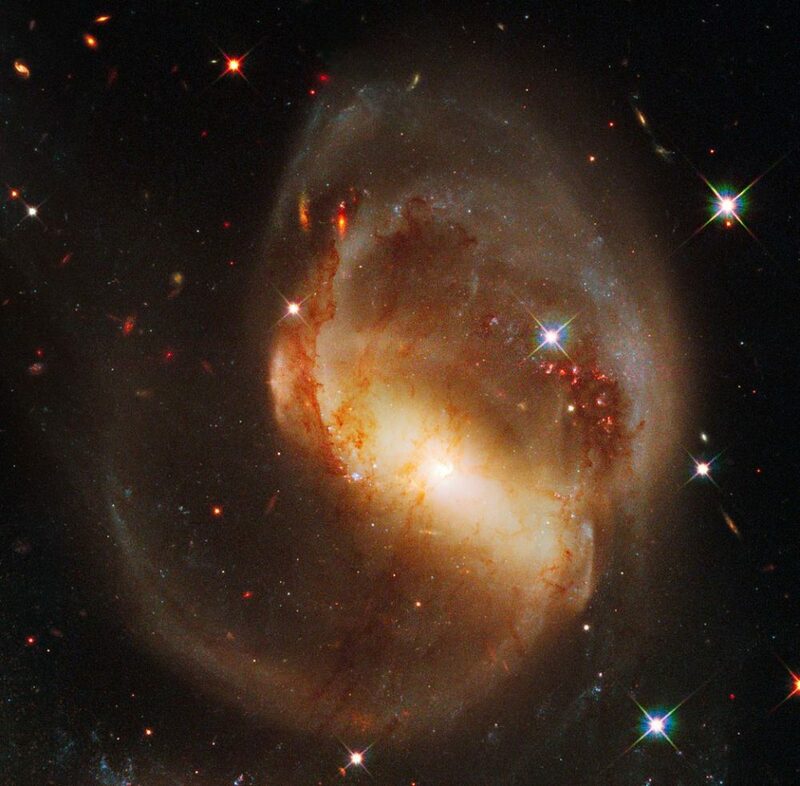 The interacting galaxies in Stephan’s Quintet lie at an approximate distance of 300 million light years and will eventually merge into a single large elliptical galaxy. The member of Stephan’s Quintet that is not physically associated with the compact group, NGC 7320, is considerably closer to us, at a distance of 39 million light years. The galaxies in the middle of the group, NGC 7318A and NGC 7318B (mag. 14.4 and 13.9), have already begun to merge with each other. 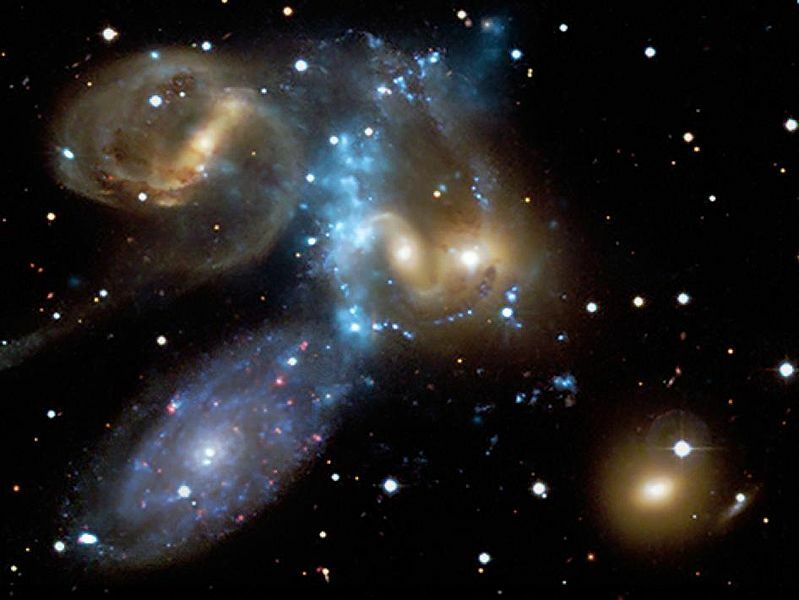 The collision has drawn out long tails of stars from each galaxy and triggered massive bursts of star forming activity. NGC 7318B is falling into the centre of the group at a speed of several millions of kilometres per hour, causing an enormous intergalactic shock wave, one bigger than our galaxy. This was first detected in radio observations in the 1970s, when a filament of emission between the galaxies was discovered, but its nature was uncertain at the time. In visible light, the same region shows a green arc, a faint glow of ionized atomic hydrogen. Infrared observations with the NASA Spitzer Space Telescope have revealed a strong molecular hydrogen emission resulting from the shock wave. It is one of the most powerful formations of molecular hydrogen ever detected. The strongest emission emanates from an area close to the centre of the green arc seen in visible light images. All five members of Stephan’s Quartet are redshifted, i.e. they are moving away from us. However, NGC 7320 has a considerably smaller redshift – 790 km/s – than the other four galaxies, which are moving away at almost 6,600 km/s. NGC 7317 has a slightly oval disk and is classified as an elliptical galaxy. It has an apparent magnitude of 14.57 and an apparent size of 0.4’ by 0.4’. The galaxy spans less than 0.5 arc minutes across. NGC 7318 was believed to be a single galaxy at the time of discovery, but is now known to consist of two separate interacting objects, NGC 7318A and NGC 7318B. NGC 7318A is an elliptical galaxy with an apparent magnitude of 14.4 and an apparent size of 0.9’ by 0.9’. NGC 7318B is a barred spiral galaxy occupying an area 1.9’ by 1.2’ in size. It has an apparent magnitude of 13.9. NGC 7319 is a barred spiral galaxy distorted by the interaction with other galaxies in the group. It has an apparent magnitude of 14.4 and occupies 1.7’ by 1.3’ of the apparent sky. 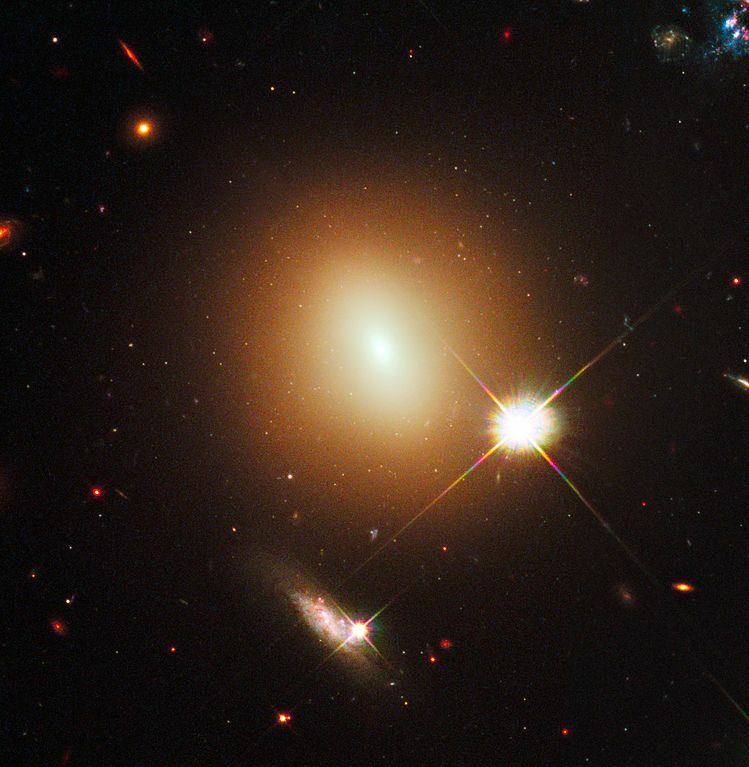 The galaxy has a type 2 Seyfert nucleus and the characteristic bright core. NGC 7320, the foreground galaxy that is not part of the compact galaxy group, is a barred spiral galaxy with an apparent magnitude of 13.2. It has an apparent size of 2.2 by 1.2’. The galaxy contains vast H II regions where new stars are being formed. 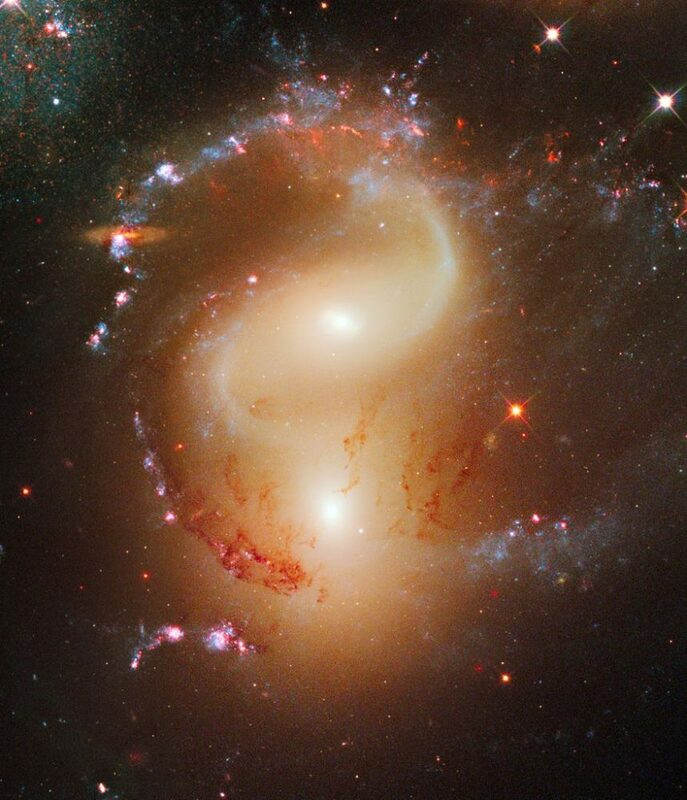 The galaxy’s redshift is similar to that of the nearby NGC 7331, which indicates that the two galaxies may be gravitationally associated. A sixth galaxy, NGC 7320c, can be been a little further away from the visual grouping. 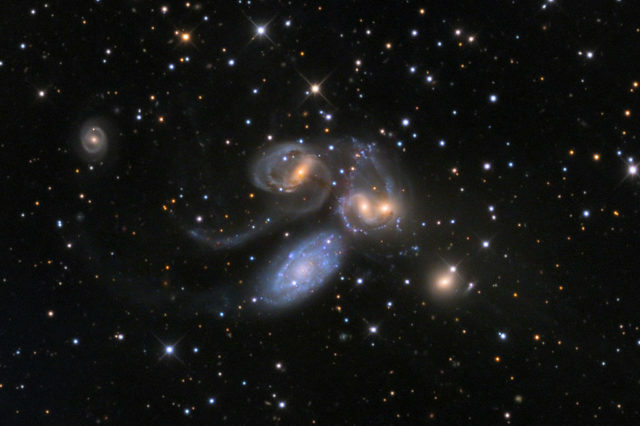 It is not a member of Stephan’s Quintet, but likely belongs to the Hickson Compact Group based on its redshift. The galaxy also exhibits a tidal tail that appears to connect it with NGC 7319. NGC 7320c has an apparent magnitude of 16.7 and occupies an area of 0.7’ by 0.6’ in size. 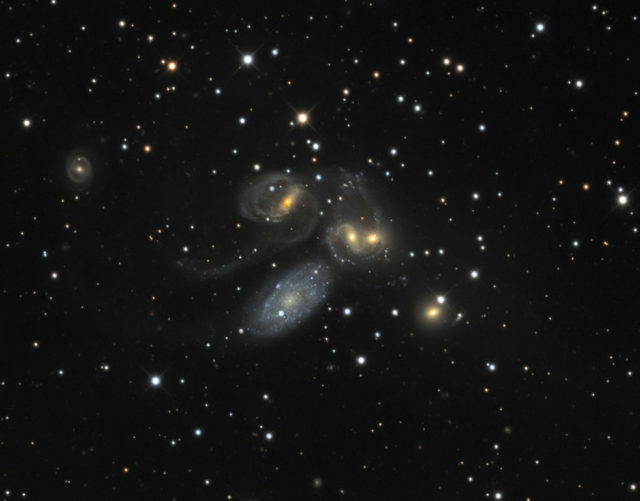 Stephan’s Quintet was named after Édouard Stephan, French astronomer and director of the Marseille Observatory, who discovered the visual grouping in 1877.